Swansea City midfielder Leroy Fer and striker Wilfried Bony have both been ruled out for the rest of the season. 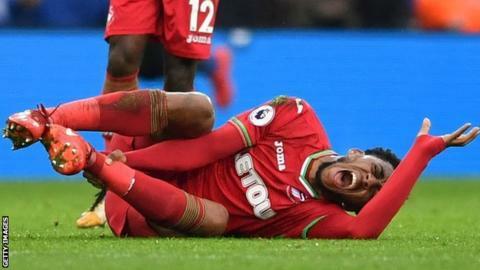 Both players require surgery after suffering injuries in the 1-1 draw at Leicester City that lifted the Swans out of the relegation zone. Fer, who was taken off on a stretcher in the first half, has ruptured his Achilles tendon. Bony, a summer signing from Manchester City, will also need an operation after tearing his anterior cruciate ligament. Swansea are 17th in the Premier League. In a statement, Swansea explained that Bony was injured just moments after coming on as a 71st-minute substitute, but he played on before leaving the stadium in a knee brace. Bony, who returned to the club from Manchester City on transfer deadline day, has scored three goals in 19 appearances this season. Fer, 28, has also scored three goals this term and has been a regular starter under both manager Carlos Carvalhal and previous boss Paul Clement, playing in 26 games.